Adaptive Meat Cutter Knife has a larger than normal, curved, stainless steel blade to allow you to cut using a rocking motion. versus the more common "sawying" motion required with most knifes. 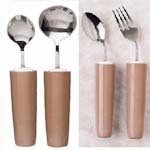 Cutting with a rocking motion is helpful for individuals with the use of only one hand or who have limited hand strength due to arthritis, stroke, or Parkinson’s disease.or other conditions which result in poor hand motility. 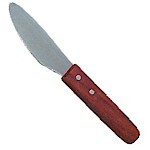 Rocker knife has large wood handle will fit in any size hand and aids greatly in the cutting process. 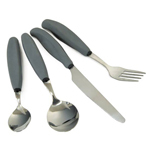 Elderly users and users with or without special needs will comfortably grasp the knife and hold on to it. Not recommended for dishwashers due to the wooden handle. Comes in a package of two knives. 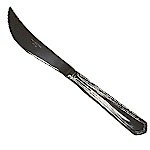 Adaptive stainless steel Rocker Knife cuts through tough meat and thick vegetables with little effort. 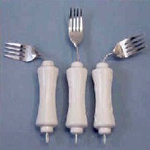 Ideal for the elderly and people with arthritis, limited hand dexterity or who has the use of only one hand!